For ancient Greeks and Romans, Hieropolis, in the Anatolian southwest of our mystery country, was a luxury spa destination. Visitors today probably know it best for the travertine-terrace pools, which inspired the modern name, Pamukkale or Cotton Castle in the local tongue. Formed by millions of years of mineral deposits from the thermal waters, the white terraces rise abruptly from the valley floor to over 500 feet high and can be seen from 10 miles away. 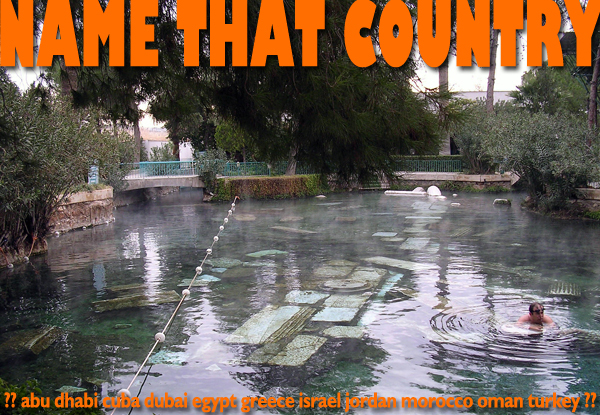 This entry was posted in name that country quiz, Turkey and tagged anatolia, hieropolis, pamukkale, Turkey, turkey tours by yalla2013. Bookmark the permalink.